Mico: Was Once King of the North! Life has not been perfect for calypsonian Roosevelt 'Mico' Williams. The effects of an accident and the medical treatment that he was given after 1979's Hurricane David are physically evident. And Mico says he has been attacked in many ways for his calypso lyrics. But make no mistake; Mico is not a wallflower by any stretch of the imagination. In fact, the 16-time calypso King of the North is feisty, sprightly, upbeat and outspoken. And, after many years, continues to make his contribution to the world of calypso — unapologetically. Mico had also won the national road march competition. 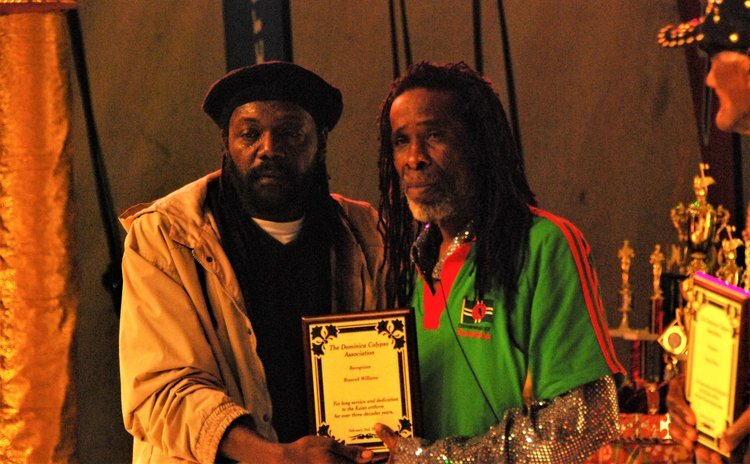 In January, 2016, the Dominica Calypso Association (DCA) inducted him into the Kaiso Hall of Fame, recognising his record of winning the most calypso crowns in Dominica. Mico was quick to point out that he was inducted at the same time as the Mighty Sparrow, whom he has always admired. Born in the heart of Portsmouth, Mico qualified to perform at the national finals at the age of 15. He already had a bit of experience performing at small school shows by the time he moved on to the competition for the North. Mico laughingly recalls when he attempted to perform at his first competition for the North. He was absolutely nervous and scared and it only grew worse as the emcee drew closer to calling his name. "My heart started beating….as my name getting closer. To me I getting more fear inside of me…when they call my name and I see the curtain and I watch the audience I say 'no, I finish with dat'." The show was at a standstill and the organist went to see what was wrong when Mico failed to appear on stage. Realising Mico was nervous, the organist gave him some alcohol to drink, but that didn't work. The organist then ran into the audience and returned with a pair of dark sunglasses. Mico could hardly see the audience and that was how he was able to perform before them. He was the second runner-up that year, but Mico swore that he would win the crown the following year. "I blame myself for not winning that crown. And I tell myself well next year I am going to take that crown." And so he did. He became the first Portsmouth contestant to win the crown for the North. Mico believes some politicians back in the day hated his lyrics and wanted him dead. He believes that he was given medical treatment to affect his nervous system when he went to the hospital to treat an injury suffered in the aftermath of Hurricane David. Despite these suspicions, Mico continued to do what he loves, which is to sing songs that spur change. He considers calypso the voice of the voiceless. "Many people have burdens and no outlet to make their feelings known, so it's like you representing them…." Mico said, adding that's why he is known as the ghetto king. One of his fondest memories was of meeting 'Mighty Sparrow' as a child when the famous calypso singer travelled to Portsmouth to perform. "I walk up to Sparrow and I say, "Sparrow, when I get big I am going to be a king like you." He hold me so and brought me inside the place. He was going to perform that night." To move local calypso forward, Mico wants organisers of competitions to do more to facilitate the participation of rural calypsonians. Explaining, Mico said he has to wait until late at night in Roseau to practice with the band for the national competition and then walk 20 miles back to Portsmouth. While accommodation is provided, Mico said he is unable to remain in town as he has commitments at home. In a biography for his 2016 Hall of Fame induction, the DCA referred to Mico's long distance walking, saying that he "literally walking from Portsmouth to Roseau and back, several times and over many years in the name of calypso. Like the proverbial soldier, Mico just keeps coming and coming, year after year". And Mico would prefer to perform in Roseau competitions with the band he practices with for competitions in the North. But for that to happen, Mico would have to foot the bill himself.